This one shot is based around a little girl and her cheeky innocent behavior, which, to the viewer might seem hilarious, to her young, single father they are not. It is clearly depicting the most pure form of humanism, and if you're looking for a story that will make you feel warm and fuzzy, this one is for you. The art is presented in a clean, elegant manner yet it's very vivid and immersive; you can nearly feel the cozy sun in your skin. It makes you forget about all your problems for a little while. Comedy is presented in a subtle way on this piece of work. It displays the contrast between the innocence of a child and the rougher point of view of an adult. Yet, far from making it dramatic, it makes you feel like "aww, what a cutie!" 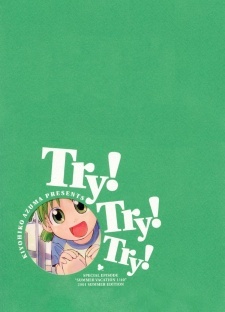 instead of "woah, wish i was a child again..."
To any of you who has just stumbled on this page : I strongly recommend that you give this manga a shot. It's only has a few pages but by the time you already go through them you will be already wanting for more.